TEMPE, ARIZ. – Team U-Haul didn’t dent the win column this year, but it relished a memorable day and took solace in knowing its participation in the 2015 Kurt Warner Ultimate Football Experience helped support an important cause. 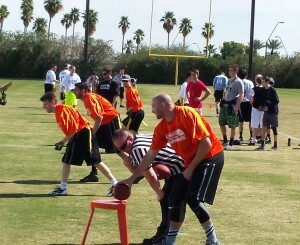 Team U-Haul quarterback Brian Hoyer gets ready to start a play at the Kurt Warner Ultimate Football Experience. 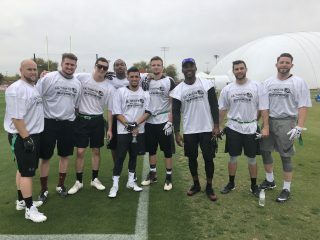 Eight U-Haul Team Members played in the prestigious flag football event hosted by the former two-time MVP quarterback on March 7 at the Arizona Cardinals’ training facility in Tempe. 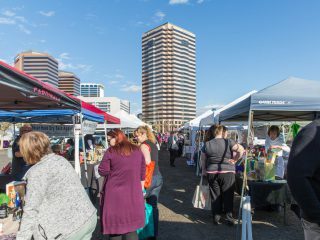 The Kurt Warner UFE is the main fundraiser for Warner’s First Things First Foundation, of which U-Haul is a corporate sponsor. First Things First helps hard-working, single-parent families achieve their goal of home ownership. 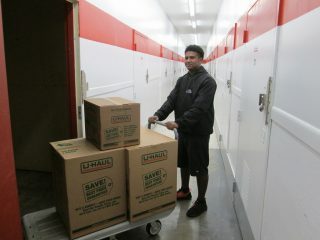 This marked the fourth year that U-Haul supported the Kurt Warner UFE and the second year that it entered a full team. 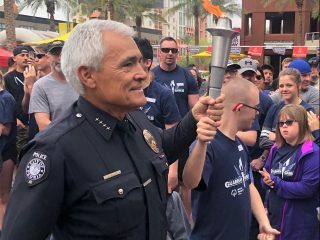 One current or former NFL players joined each team to play quarterback in the event, and teams chose their quarterbacks based on the results of go-kart racing, Segway driving and football throwing at the March 6 draft party at Octane Raceway in Scottsdale. 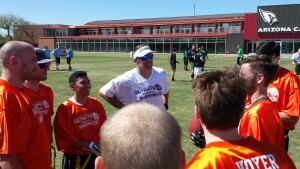 Event host Kurt Warner speaks to Team U-Haul before a game against his team. 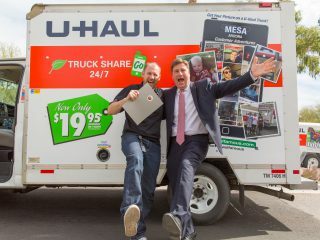 Warner quarterbacked Team U-Haul in 2014. 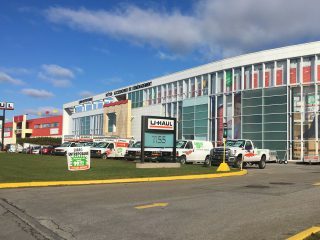 U-Haul selected third among eight teams and drafted former Cleveland Browns and new Houston Texans quarterback Brian Hoyer. 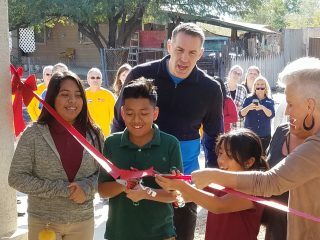 Hoyer, who signed a two-year, $10.5-million free-agent deal May 11 with the Texans, partnered with Albert Alvarez, Patrick Bylow, team captain Dain Howell, Scott Kirkeby, Chasan Royer, Kyle Royer, Mike Shardy and Charlie Taylor of U-Haul. 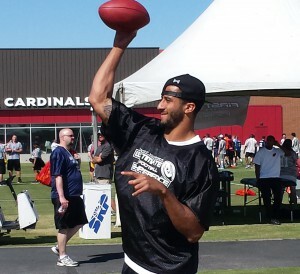 Warner and San Francisco 49ers quarterback Colin Kaepernick were the first two pros drafted. Rudy Carpenter, Ty Detmer, John Lynch, Mark Rypien and Tyrod Taylor also volunteered their time and throwing arms to this year’s event. San Francisco 49ers QB Colin Kaepernick was one of the stars of this year’s Kurt Warner Ultimate Football Experience. U-Haul was dealt a difficult schedule and dropped its three pool-play games on a sunny Saturday, resulting in a rigorous draw for the afternoon’s double-elimination tournament. R&S Mattress, led by Kaepernick, edged U-Haul in the tournament opener and U-Haul bowed out in the next game, ending an exciting – and equally tiring – event for the men in orange. “It was a great time,” Kirkeby said. “We had eight great guys and Brian Hoyer. We went out there and it wasn’t as we expected. We wanted to come home with a championship. But we had a lot of fun and we supported a good cause. 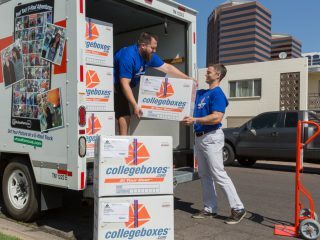 U-Haul helped furnish the homes of two Arizona families last November through First Things First’s Homes for the Holidays. 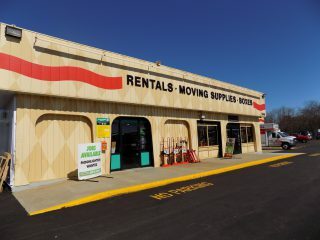 Read about the Amda family and the Roberts family on MyUHaulStory.com.